A car club dedicated to the preservation and restoration of American Austin and Bantam vehicles that were built in Butler, Pennsylvania between 1930 and 1941. We welcome enthusiasts of the Austin Seven, American Austin, American Bantam and Bantam Reconnaissance Cars (BRC). 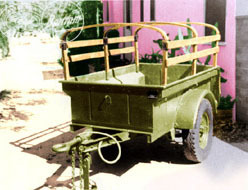 During and after World War II, American Bantam built far more utility trailers than all the American Austin and Bantam vehicles combined. The BT3 military trailers are highly popular among jeep enthusiasts. It's easy to tell the difference between the military and civilian trailers. The military trailer has a pintle hitch minus a tailgate so that it could float in water. The BT3-C civilian trailer has a standard ball hitch and a tailgate. Find more information on the jeepdraw.com third party website. Herbert Austin and his Austin Seven. Meet our cousin, the Austin Seven. The roots of the American Austin can be traced to a single ancestor, the English Austin Seven. 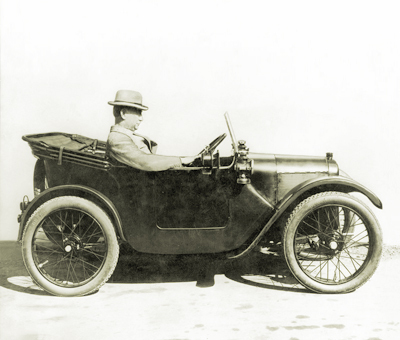 In 1904, Herbert Austin launched the Austin Motor Company in England. At first, Austin built large cars. When taxes were levied against car motors based on horsepower, he introduced the 7-hp. (British measurement) Austin Seven in 1922. Licensed versions include the German Dixi, the French Rosengart and the American Austin. For more information about the Austin Seven including a chassis register, visit the Austin Seven Clubs Association website.